I’m often asked for creative gift ideas and I absolutely love the process of finding that perfect item, it’s the perfect way to indulge my shopping habit without spending any money (and I still get that warm and fuzzy feeling when I hear how much they loved my choice!). When it comes to kids, I’m all about the pretty but practical. 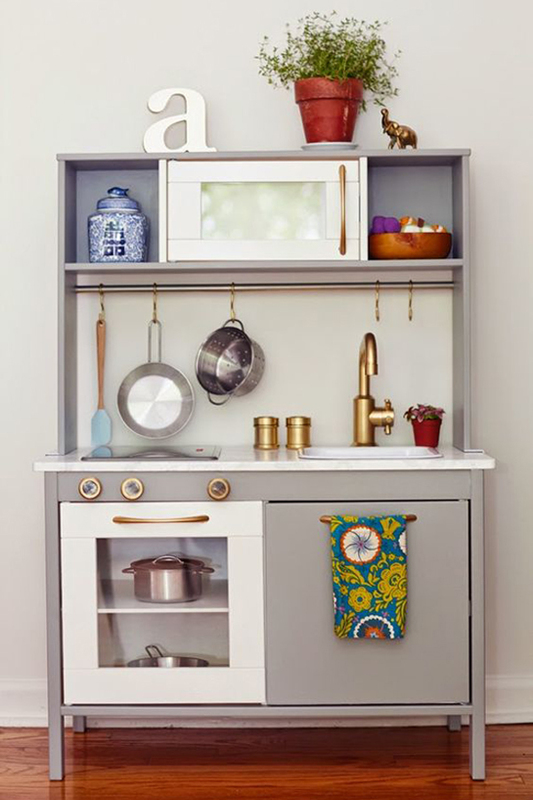 I’ll always suggest wooden toys and playsets which will withstand a good battering and still look good, especially for mums who are trying to keep at least a semblance of grown-up design in their home! 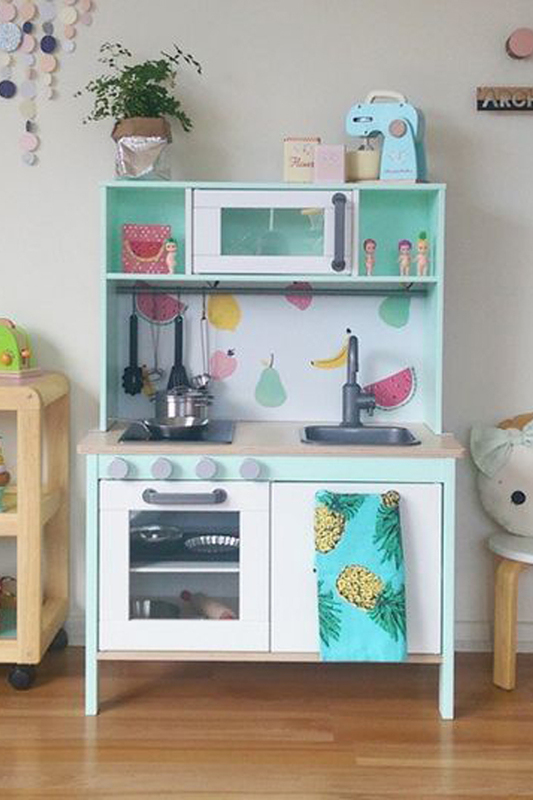 Loads of my friends swear by Ikea’s DUKTIG play kitchen, so when a friend asked me for some ideas for her soon-to-be-four-year-old daughter this immediately made it on to the list. 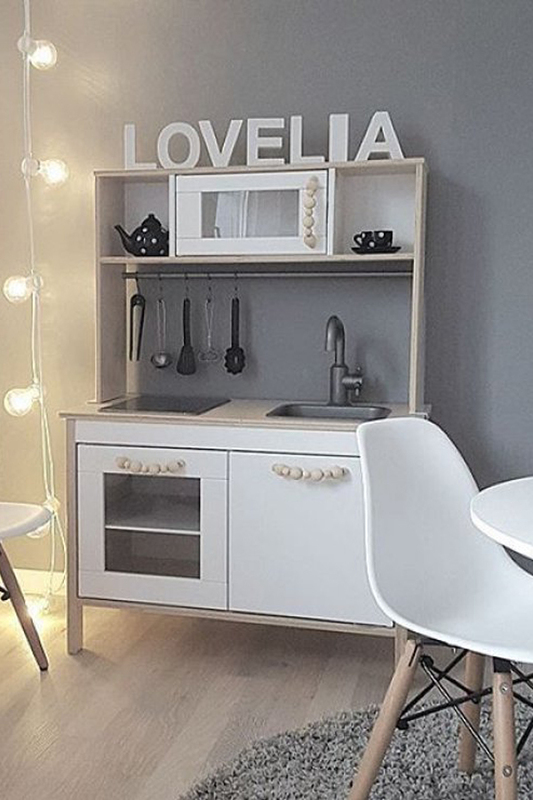 It’s pretty solid construction, but fairly basic in style, just white and natural At £65 it’s pretty reasonably priced (especially when compared to other play kitchens available) and leaves a few pennies to do what we all love most about Ikea products – the hack! Obviously these pretty designs fill my pastel-loving heart with joy! This style would make a cute addition to a little girl’s room or playroom, but I’m not sure I could resist re-styling the rest of the room too! 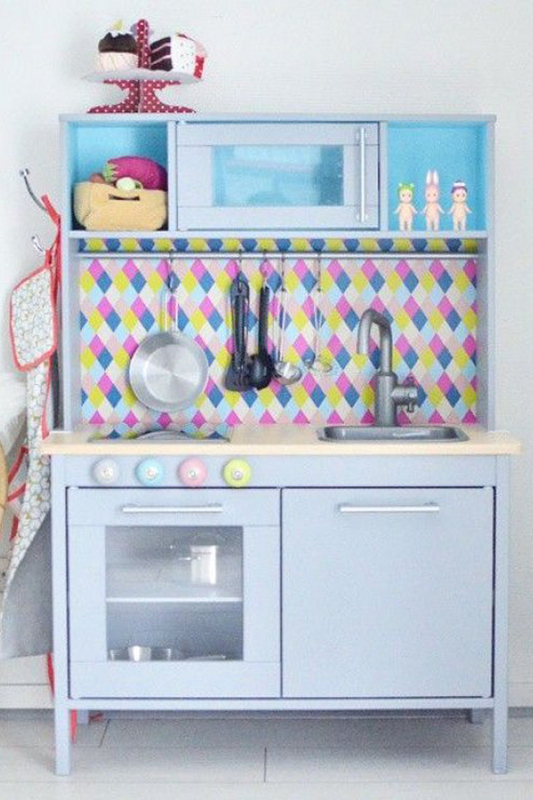 I adore the colour choices and fun wallpaper which add a fun pop of colour. If you have boys and girls (or just boys! ), a gender-neutral hack will be enough to encourage the most boisterous to fix you a cuppa. 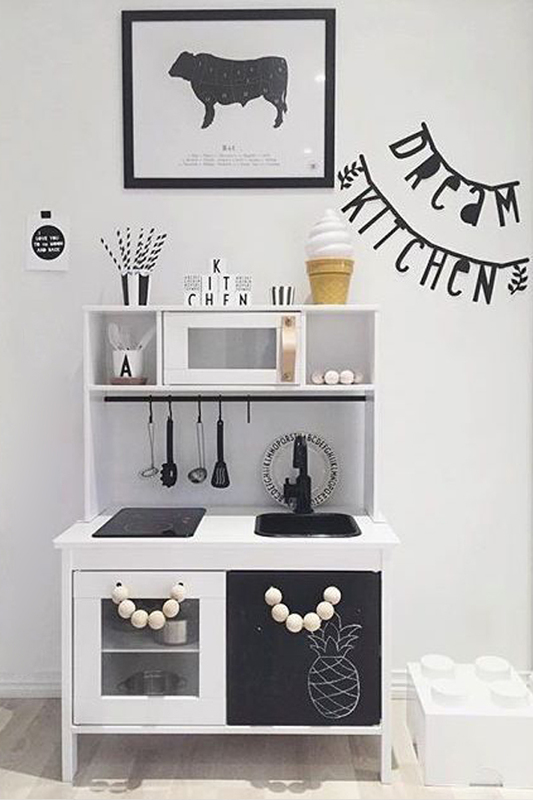 I love the addition of chalkboard paint to the doors and the chic monochrome styling, especially those chunky handles which are perfect for little hands! 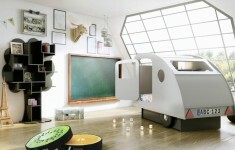 In smaller homes, chances are your little one’s toys are (proudly?!) 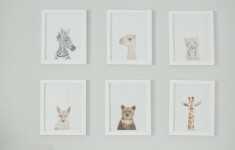 on display all over your house, so a stylish set that matches your home decor is a parent-friendly choice. 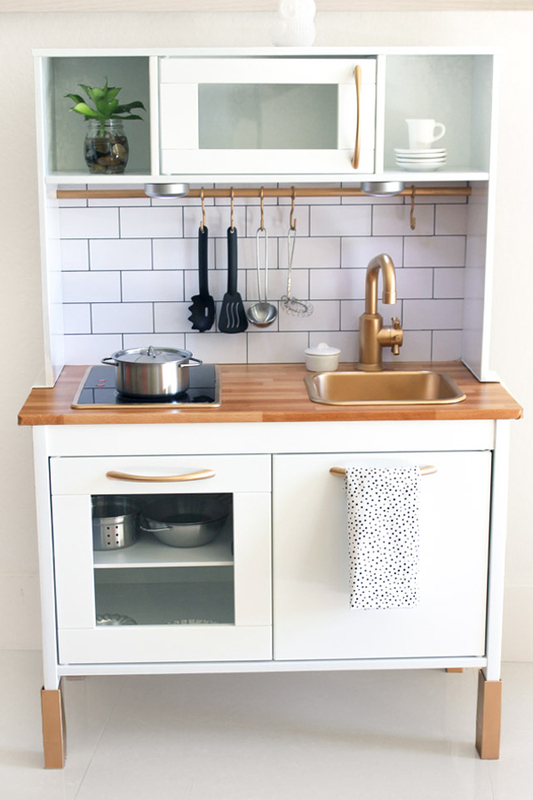 I while I love the elegant grey and copper fittings, the addition of a metro tile splashback and wood-effect worktop, which makes this kitchen just like mama’s! 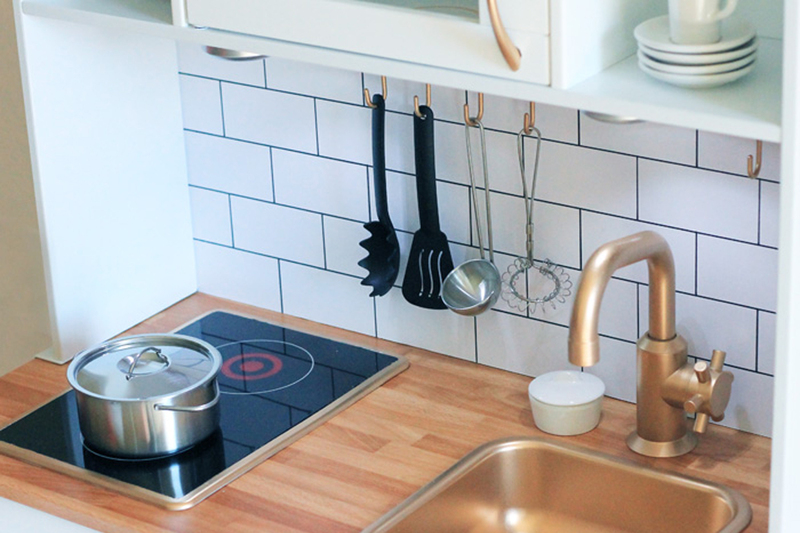 If only my kitchen was as pretty…. !